This 1700 sq. ft. plush WATERFRONT CONDOMINIUM provides the ultimate in waterfront luxury. It is professionally designed and exquisitely decorated with all new furnishings and a modern crisp cleanliness. It comes fully equipped with 3 flat screen tv's, top of the line appliances, dishes and kitchen furnishings, granite countertops, wifi, iPod dock and speakers, full laundry room and of course a breathtaking view of the river and amazing sunrises and sunsets from the spacious wrap-around balcony. + More than 1700 square feet of spacious living! + 2nd floor unit with elevator access. + Breath taking views from the balcony, living room and master bedroom. + 1.5 miles to the Coeur d'Alene City Park where the Iron Man Triathlon is held. 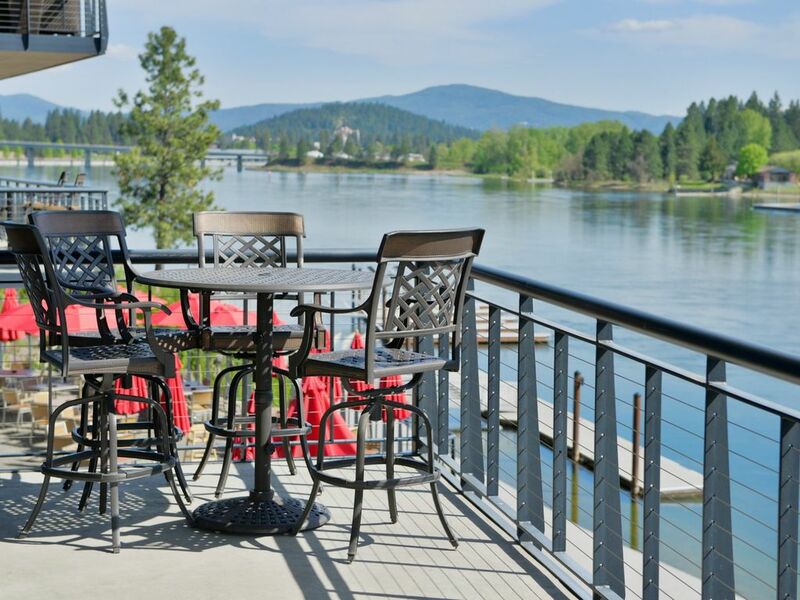 + Hop a ride on the free Trolley to City Beach, Coeur D'Alene Resort or the old downtown. + Walk to Riverstone Park Lake and enjoy a relaxing evening concert at the outdoor lakeside amphitheater. + Walk to the luxurious Zi Spa, numerous restaurants and retail stores. + Use our secure storage area (6x9) to bike on the 30+ miles of paths on the nearby North Idaho Centennial Trail. + Day-use dock available for boats, kayaks and canoes. The world famous Coeur D'Alene' Resort Golf Club, Home of the World's Only Floating Green (18 holes over 6,804 yards with a par of 71); Ponderosa Springs Golf Course (9 holes over 1,234 yards with a par of 27); Coeur d'Alene Golf Club (18 holes over 6,309 yards with a par of 71); Highlands Golf Course (18 holes over 6,306 yards with a par of 73); Avondale Golf and Tennis Club (18 holes over 6,573 yards with a par of 74) and so many more! Silver Mountain, 30 minutes away and Schweitzer Mountain Resort, 90 minutes away. CONCIERGE SERVICE AVAILABLE: Our concierge service is available to assist you in making any type of arrangements you may desire. We can have groceries or fine wines waiting for you, arrange for a boat or jet ski rental, spa appointment, theater tickets or pretty much anything else you may need. For more information, please contact the owner(services not included in rent). The kitchen is fully stocked with a 12pc dish set, tupperware, glasses, measuring cups, cooking utensils, knives, covered sauce pots and pans, coffee maker, tea kettle and more. All Stainless Steel Appliances, large pantry and granite counter tops. We have 2 bicycles for your use that are kept in a secure area. PREMIER GOLF COURSES: CDA Resort Golf, Ponderosa Springs Golf Course, Coeur d'Alene Golf Club, Highlands Golf Course, Avondale Golf and Tennis Club. Amazing location, quality, high-end, spacious!! Our family stayed here a second time to ski at Silver Mountain. We love the condo, the view, the walking to delicious restaurants and ambiance. Door to ceiling glass views of the Spokane River, huge perfect open big kitchen, open to living room made it so nice for our family to relax and cook. Have breakfast at Le Peep! Thanks for hosting us! Place was great!! Stayed here before and will be back. Very comfortable and well stocked. Can’t beat the river view and central location. Nice complex, nice unit, great scenery. Julie was very helpful when I had any questions. We loved our getaway weekend to Coeur d'Alene. The condo was homey and comfortable. Very quiet. Highly recommended! My husband and I stayed here two nights in early October on our way to Montana from Seattle area. The condo was spacious, clean, great location. Would definitely stay again. A must is breakfast at the restaurant right next door! Boat Rentals, Casino, Water Park and Slides, Dinner Boat Cruise. There are also 2 bikes in our storage locker that you are welcome to use.